© 2004, Marvin Bartel. You are invited to make a link to this page. Art teachers may print a copy for their own use and teachers may forward this page to other teachers so long as the copyright and Internet URL (address) is with it. This lesson may not be posted on a web site or published in any form without permission. Brief credited quotations in scholarly reviews are permitted. In a perfect world art teachers would have unlimited supplies. Local hardware retailers sell small amounts of many types of wire, but it can be too expensive for many school budgets. Unlimited wire might be one of the materials you can have for the asking. I know a teacher who has been given free access to the local iron and metal recycling yard. They recognize him, trust him, and allow him to come and pick up whatever is useful in his art classes. At the end of each year he returns what is not used. Since they also allow him to use the metal for his own work, he has given them one or two sculptures for display in their office. If you find a benefactor in your community, it would be appropriate to give them several matted and framed photos of your best student work made from their materials. Other businesses and factories produce lots of good scrap materials. Companies that repair electric motors might have old motor windings made of various sized copper wire. 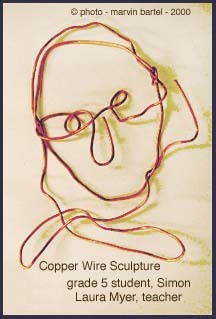 Copper, if you have thickness variety, works great for wire sculpture. Various metals vary in softness, so feel the wire to see how hard it is. Wire coat hangers may be free, but they are nearly impossible to bend without some serious shop equipment. 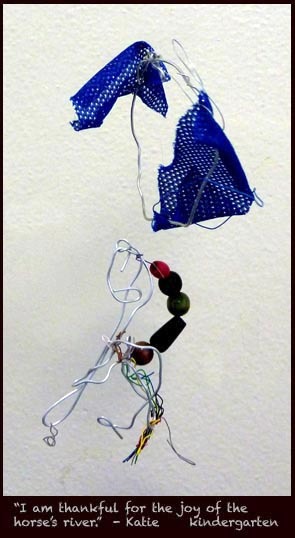 Wire sculpture requires pliers for every student and wire cutters to be shared at each work table. If your school lacks basic tools, try to add a few from each year's budget. In the meantime, see how many students are able to loan pliers and wire cutters to the art classes while they are working on wire sculpture. Small jeweler's bench vises and wire bending jigs are also useful but not essential. A web search will find a number of sources. Wire of the same metal can be softer or harder, depending on how it has been made. Drawing wire through a die to make wire thinner has made some wire much stiffer. Copper and aluminum are generally softer than steal, but any wire can be used. Stiff and springy wire can be annealed (made softer) by heating it red-hot and then cooling. This is an adult activity, using a torch or kiln at about 1,000 F or 540 C. Using a kiln would be safer, but be sure the wire does not melt and ruin the kiln. I use a check list when putting things in a kiln to remember to make all the settings correctly before starting the kiln. Older children can learn this if there is a ono-on-one experienced adult watching carefully. Safety goggles are essential for all concerned. Hammering on wire after it is formed can stiffen it. Foster Art Studio Culture: Teach capable students to assist other students as coaches. They are not allowed to do work for others. Be sure everybody participates - no spectators allowed. Some teachers accomplish this by placing students in mutual assist teams. 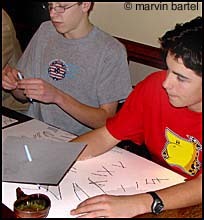 Teams of two or more students make sure everybody achieves basic technical competence. OPTIONAL creativity culture motivator: Hand out copyright certificates to the five sculptures that are most original based on a secret ballot by the class. See endnote on how to start the class without wasting student time. Optional Art Studio Culture motivator: A small team of students learns to photograph completed works in front of a neutral background using the classes digital camera. Post the photos for the whole school to see. Post a list of learning objectives with each art display in the school. Optional Art Studio Culture motivator: A team learns to design the display of work from the project. Optional Art Studio Culture motivator: A team learns to update the web site for parents and others. What if web sites would show the practice stages and not just the final results? What would the parents learn about the way creativity is cultivated in an art class? What effect might this have on the sale of all those inane "how to do it" craft books? Optional Art Studio Culture motivator: Teams who have learned photo skills, display skills, and web page skills, teach the skills to other teams until every student is capable of photographing artwork, setting up attractive displays, and creating attractive artwork web pages by the end of the term. Don't forget the CRITQUE Double the learning. If you have had a bad experience with critique, check this page for a new approach. 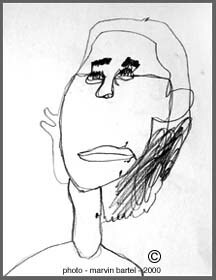 Self Portraits by a 5th grade boy. A practice drawing using a mirror by a grade 5 student. A second practice drawing with the intention of using wire - again using a mirror. See other self-portrait ideas using mirrors and cut paper. Like fishing, art making takes patience, skill, and discrimination. Sorting is an important skill to learn. Learning to sort art for quality is harder than sorting fish, but the analogy still works. Sometimes when fishing I keep a basket of small ones, but before going home, I release all but a few nice ones because cleaning fish is too much work to bother with the smallest ones. Another way to fish is to keep six fish and when I catch a seventh, I release the smallest so that I only have to clean six fish. I have often gone fishing and tossed back more than 90 percent, but the big one or two is still rewarding and tasty. Too often we think we have to keep all our results - not realizing that there are much better things to come. - only some good open questions, careful verbal explanations, careful observation, and plenty of preliminary hands on practice and artistic thinking. We CAN encourage thinking habits that imitate the artistic process - not imitate another artist's work. Calder did not copy other artists work - he copied their inventiveness. He played with materials and learned from them. He used his imagination. Start with a time of play and experimentation. Provide supplies and tools. 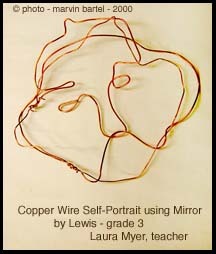 Invite students to do wire experimentation, manipulation, tool use, and fastening techniques. Everybody searches for ideas that are shared with the whole class. Think of wire as line. Make three-dimensional drawings. Ask, "What happens as you turn the piece around a view it from every angle?" Wire is perfect for making three-dimensional linear form. BE SAFE - Shorter wire lengths are less apt to accidently hit self or another person in the face or eye. For younger kids, we can pre bend the tips of the pieces back so they don't poke. Thinner and softer wire and pipe cleaners are safer than stiffer and thicker wires. The teacher awards honorary patent certificates to originators and inventors who figure out ways to fasten the wire, produce unique line character, etc. Give advance notice - expect "homethink"
Artists trust and use their subconscious mind to come up with creative ideas. This requires advance thinking and problem definition. Many students do not know this. They learn it if we establish it as a routine habit in studio art classes. Announce at least a day in advance (a week or more in advance is better) that you will be asking them for original hand gestures. Encourage hand gestures or sign language symbols (any non-profane gestures). Use a minute at the end of each period to ask them to practice their ideas in advance of this lesson. Hand gestures are a common form of communication between people who do not understand each other's language. This site shows sign language used between Europeans and Native Americans during pioneer times. American Sign Language makes extensive use of hand gestures and motions as a formalized means of visual communication among those with hearing deficits. 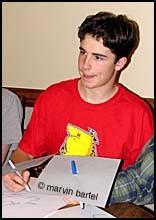 Children might like to know how their first name is spelled by signing. Feelings are signed with a combination of hand position and motion. Using the hand gesture ideas they have developed, students all wrap contrasting yarn around one hand (tape it in place). They study the yarn from all directions. Then, by drawing the yarn, not the hand that is in it, they make line drawings of several views. Allow and expect fast students to make more variations than slower students. All students sketch several view points and gesture variations (turning the hand to see several views). Take off the yarn and use both hands to make a similar hand in wire. Provide wood block bases with holes, tape, or staples to mount the wire hands. These are three-dimensional drawings of the yarn that was previously sketched, but do not worry about being faithful to the sketches. Think of the sketches as preparation notes. Sketching prepares the brain. Rely on the wire to express itself. Discuss the thing they notice most about each piece and make sure everybody understands the reasons for the effects. Ask for several nominations based on originality. Which sculptures show you things you have never seen before? Which sculptures show you three-dimensional ideas, and are effective as sculpture in the round that make you want to move around it to see how it looks from every direction? Why does make the effect that it has? Which works show efficiency and directness showing more with less? Which works show involvement and complexity, holding your attention the longest? The teacher does not praise any of the above qualities as being superior to others, but they are all learned as important bits of awareness and choice making. This list is intended as a start. As an artist/teacher you will add many other awareness items to these discussion lists. Critique is not a way to judge. The purpose of critique is to make discoveries based on unanticipated outcomes. Art is a search and critique is the looking for what has been found and what strategies work to find that which was not anticipated. Once the students have some confidence it is good to increase the difficulty level. Try having them wrap a person with bright ribbon using masking tape to keep it in place. Cheap plastic ribbon (visibility tape used on surveyor's sticks) is available at building supply stores. Have students pose the model in an active three-dimensional stance giving the model someway to hold on to supports (like and easel, tripod, post or some sticks) so the pose can be held long enough for wrapping and sketching. A complex sitting or reclining pose also works. Here blinders are placed on markers. Students may look under the blinders to place the marker at the right spot, but they must look at the model whenever the marker is moving on the paper. Blinders serve as "helpers" to discourage too much obsessing about the correctness of the drawing. Brains that learn to draw learn to attend to what they are observing. Have students design the ribbon wrap. Review choices of repetition, variation, line character, motion, unity. Ask continuum questions dealing with things such as active-passive, smooth-jagged, big-little, straight-curved, moving-stationary, vertical-horizontal-diagonal, and so on. Students sketch several points of view. If the model is a class volunteer, change models and repeat everything so the model gets a chance to sketch. 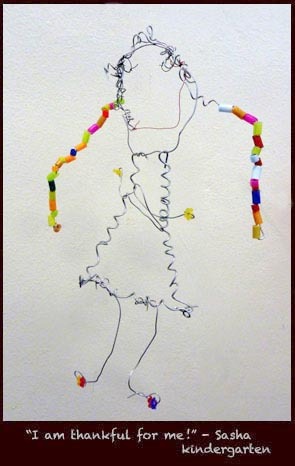 Students fabricate wire sculptures from their minds using imaginary poses. The teachers require action, motion, and three dimensional awareness. Students experiment and choose ways to solve these requirements. Allow and encourage exaggeration and strong variation. When questions come up have them ask each other to temporarily take a pose to help figure out how something might look. When questions come up have them sketch or make experimental wire fabrications from which to make choices. Ask for several nominations for original ideas. Which sculptures show you things you have never seen before? The teacher does not praise any of the above qualities as being superior to others, but they are all learned as important bits of awareness and choice making. This list is intended as a start. As an artist/teacher will add many other awareness items to these discussion lists. When we view the work we often discover more and more ideas to bring into the awareness of the makers. Projects like this can take a several several art class sessions. Learning is not increased by skipping on practice or by taking shortcuts to get the product done with less thought and choice making by the students. Considering all the possible variations, lessons using wire can be repeated so long as a few new variations are used or so long as students are interested in improving previous variations. Work with live plants and trees. Bring in some interesting branches. Combine them in unexpected ways. Bring in live animals, birds, barnyard foul, etc. Practice making contour sketches from every angle of the animals. Make wire animals. Study the unique motions made by various animals and represent the the movement with line. Every student who has them brings in action toys from which to sketch and then invent in wire. Ask for volunteers who have studied dance to show the class a series of dance positions. Ask for athlete volunteers to act out sporting actions for the class. Have students move to several types of contrasting music. Make lines that represent the feel of each contrasting music type. Make choices and interpret the music three-dimensionally and non-objectively in wire. Use music as above, but plan the work to represent the movement of flight and hang the work from the ceiling. Combine wire with tag board paper shapes and colored paper shapes using transparent box tape wrapped around the wire to hold the paper pieces in place. Add copper foil to fill in some of the spaces creating formed planar areas. Fasten it by wrapping, wiring, taping, gluing, or soldering. Add wire mesh such as fly screen material to create translucent formed sections. Add paper mache, plaster, or used chewing gum to parts of the pieces. How does this lesson teach creative thinking? Students can do all these things without seeing any examples from the teacher, Internet, books, former students, etc. The work can be 100 percent theirs based on their own responses to concepts described and worked (played) with. Practice activities give them choices from which to improve their results. They learn that their own working process can generate successful results. Students build self-esteem and know that art can be produced without reliance on influences that have little or nothing to do with their own interests or concerns. This lesson teaches creative thinking because each variation requires the solving of new problems. When an assignment sets a material limit or content limit, creative thinking is required to figure out how to cope with the new limitations. A few students will insist on violating the limits. If I see that a student is breaking rules in an attempt to make the work better, my response is to enthusiastically affirm boundary breaking. If is an attempt to bypass thinking and problem solving by using old tried and true methods, I may decide to disallow it, and redirect the student to the problem. How does this lesson teach critical thinking? The teacher tells them in advance that artists toss a certain percentage and keep the winners and only display the best. This is why we practice. The teacher assures them that it is okay to be discriminating with our own work. However, it is important that students are not allowed to toss their work before seeing and assessing their choices. Nothing is discarded before more practice work is finished. Often the work itself has things to teach us about new ways of seeing. Doing more than one product per person is a good way to be able to learn from comparisons. Pieces of wire can often be reused a number of times. Consider extra eyes when assessing work. Encourage teams of students to help each other find the good things in their work. I prohibit bad-mouthing. Negative comments are seldom useful in peer group art discussions. I use positive and neutral questions. A good neutral discussion question is, "What do you notice first, and why do you notice it?" I think the "why" questions are most useful because they help students learn new visual concepts. During the time students are working, the art teacher should watch for appropriate times to stop the work and ask some questions. This is an opportunity to let students in on the ideas and concepts that artists would consider as they work. It is good to do this with questions that bring to mind personal ways of responding. This can also be good classroom management at times when students are getting too noisy or when some students do not seem to be on task. The teacher also writes questions on the board or on a poster so that students can review them as they work. These are sample questions, but teachers and students should feel free to add to this list. How is your work different because of the material you are using? How is your work different because it is three-dimensional? How is the effect of your work different if you have things centered compared to using informal balance? What things in your composition move the eye from place to place? What creates or implies motion in your work? How does it change the effect of the work if lines and shapes are flat compared to bending them back and forth? Where is the most dominant part of your work? Where is the second most dominant part of your work? What happens if you make an area less or more dominant? Every visual element can be contrasted strongly or related quietly. As you study your composition, what are the strongest contrasts in your work and what are most quiet relationships in your work? Do any parts of your work create a frame within the frame or edge of the work? 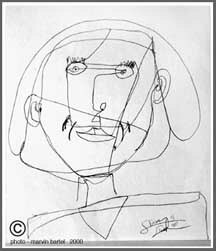 Are any parts of the work that are negative shapes that could be repeated as positive shapes? As you look at your work, which parts come forward and which parts go back? Do some things that really come forward in sculpture look like they are may be going back? After the students have gotten good at it and posted the best example of each student in a hallway showcase, the they are asked to study something from art history or the contemporary world of art. Given the time restraints, not every artist who has work on the Internet is worth the class time. These are several criteria in selecting artwork to study. Am I being gender fair? Do I include as many female artists as male artists? 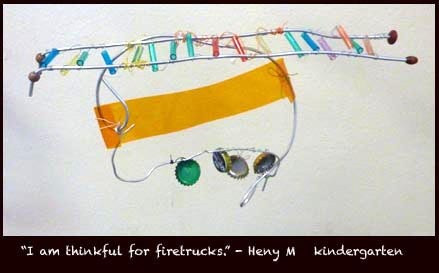 For this lesson the teacher could ask students to grade or rank some wire pieces by an artist like Alexander Calder. His sculpture is in many major cities and in nearly all major museums. Calder's Circus was an early work in wire used to make moving circus performers. This is a slide show based on a Calder exhibit at the Whitney in New York in 2008. Art History Skit Variation: A team of students acts out a skit where one student plays Calder, another plays his friend's wife who played music to accompany the circus performance, others play visitors coming to learn about his work. Another plays an interviewer who is an art critic for the Daily Express and has him explain how much he values play as a way to figure out new ideas in his work. Role Reversal Variation: Good teaching develops the capacity to imagine. Cast female students in male roles and male students in female roles. Highly creative people are people who really know how to use their imaginations. Studies of highly creative individuals show that they often come up with opposites when responding to in a free association word list. The concept of variations is stolen directly from the working habits of artists. Study the work of any artist. Nearly every work is a variation of other works by the same artist. Expertise in art is based on this wise working habit. The term variations assumes a constant. You cannot have a variation unless there is a base point from which to vary. In contrast to this basic concept, we find that many art classes are taught as though art projects come from a buffet based on every flavor and style. Expertise and quality has no chance to take root. The victims are pride, self-confidence, and self-esteem. Dependency on the teacher grows. A class of students sitting and waiting for a teacher to show them what to do today can be a well managed class, but it can also be evidence that students are dependent. If you try these ideas, send me a note if you have any time. I would love to hear about the most unexpected thing that happened. I would love to see a result or two. Reggio Emila Inspired School at Peabody, Washington, D.C. This is a book written for kids who can read who want some good ways to practice their drawing skills. Us older folks who still want to learn new stuff can also use this book. It is also great for artists who want some ideas on how to help children learn to draw better. If you are an artist, you could start a Drawing Camp or some after school art classes using the ideas in this book. Parents can use this book plan a really cool and creative kids art party. Many art teachers will find new ideas and inventions never before published.